Nearly £13m is to be earmarked by Rugby Borough Council for building or buying properties to help tackle homelessness. 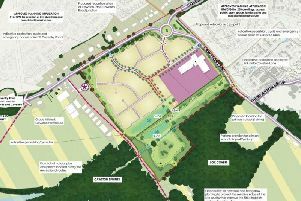 A project manager and another member of staff will be employed to oversee the plan which is hoped to be completed inside two years. Councillors at this week’s cabinet meeting agreed to allocate the funds to a housing revenue account (HRA) with the council’s head of corporate resources and chief financial officer Mannie Ketley being given the authority to approve projects and purchases. In her report to the meeting, Ms Ketley highlighted that the average number of homeless applications to the council had trebled in the past five years. She added: “Locally, demand for social housing far outstrips supply meaning that waiting times for rehousing are extended. The capital investment would mean that rather lease or rent properties and rooms in b&bs, the council would acquire or build houses with the £12.9m fund which would come from either retained Right to Buy money and/or a Homes England grant. The plan is to provide 24 shared accommodation units with a minimum of three bedrooms and 14 homes in multiple occupancy (HMOs) which would have a minimum of five bedrooms. But the report warned that with a number of other large housing projects ongoing, there is a danger of the two-year target being missed. It added: “The property management unit is currently project managing a number of significant schemes including the redevelopment of the Biart Place site, potential extensive refurbishment/redevelopment of the Rounds Gardens site, development at the Bell House site, and disposal and/or development of multiple garage sites.